1) Prayer. As the devastation of each event began to unfold on the news I didn’t have words. My heart just sank and in a deep tearful exhale I said “Dear God!” Or “Lord, have mercy!" We often think we have to have more words than this and if you can muster them, great. If like me you are so stunned that words escape you a guttural plea to our Heavenly Father is a place to start. 2) Support. Without even thinking all the people I know who live in (or were visiting) the epi-centers began to come to mind. Perhaps it did to you too. I immediately grabbed my phone and reached out to each one, trying to find out if they were ok. Phone calls, texts, and emails were sent. This was one of the beautiful things about Facebook, people began to check in and say they were safe. Others began to grieve as tragedy hit closer, more personally. Though I was miles away, with each contact I made it became more and more real. There was no 7 degrees of separation this time. You see, it shouldn’t take a tragedy to show people we love them, but often we get too busy and we never do tell them. Busyness robs us of relationship. And busyness opens the door to regret. Though friends and family appreciated the support in their time of need, it isn’t over for those who were impacted. 3) Do something. We can’t leave these people alone, we need to do something. In the past few weeks and more recently the past few hours, I’ve seen people pick up the hurting in boats and trucks to take them to safety or hospitals. I’ve seen human chains and human shields of rescue and protection. In the throes of tragedy I’ve seen the best in people. And from those on the outside I’ve seen people ask: “who needs help, what do they need, how can I help, where can I give, what can I donate, and how do we get it there.” Regardless of your proximity to the ground zero of tragedy there is something you can do. What will you do? How will you help? I’ve seen people buy strangers plane tickets to recover their family and others open their spare rooms to take in the displaced. And I’ve seen churches mobilize teams to be feet on the ground to clean up and rebuild. 4) Rebuild. And not just rebuild the buildings, but rebuilding the lives. When devastation comes it shapes people and it entrenches mindsets and beliefs (true or false). As you come along side people who have been hit by tragedy help them rebuild. Help them find truth. Help them find their identity and their confidence. Help them bear their burdens and not be buried by them. Help them hold up their arms when they can’t face it another day. Help them heal. This isn’t going to be a quick process, it will take time. This is who we are called to be, Jesus with skin on. A hand to the hurting. But we can’t be there to help if we too busy. 5) Change. So, for some of us we need to respond by changing ourselves. I’m sorry for the tough love here, but busyness is a sad self-centered excuse and this is one of the reasons getting out of a life of overwhelm is so crucial. Our world shouldn’t have to be turned upside down to get us to change. But our world has changed and we need to wake up and take a serious look at ourselves before God and ask do I have the time, the money the resources to help others. We need to ask "Am I who God wants me to be? Am I doing what he wants me to do?” And if we are, then we need to figure out how to be apart of the relief effort (physically, emotionally and spiritual). And if NOT, then we need to ask “what needs to change.” And perhaps the biggest response to tragedy will be that we are different people because of it. 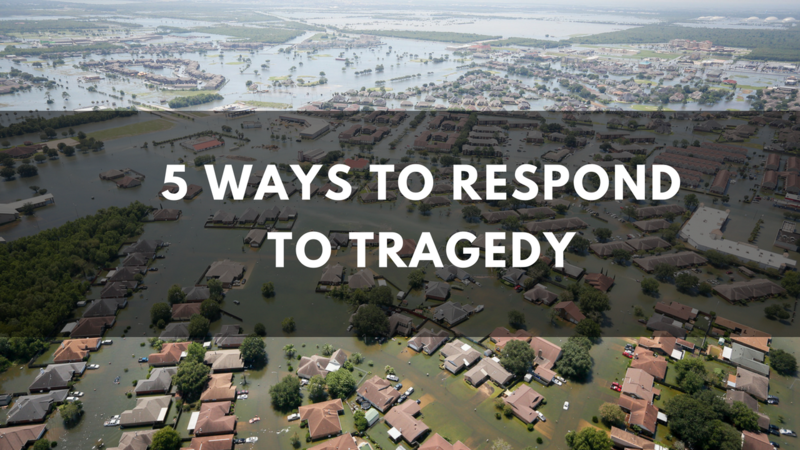 What are the practical ways you are responding to tragedy? Leave your response below.